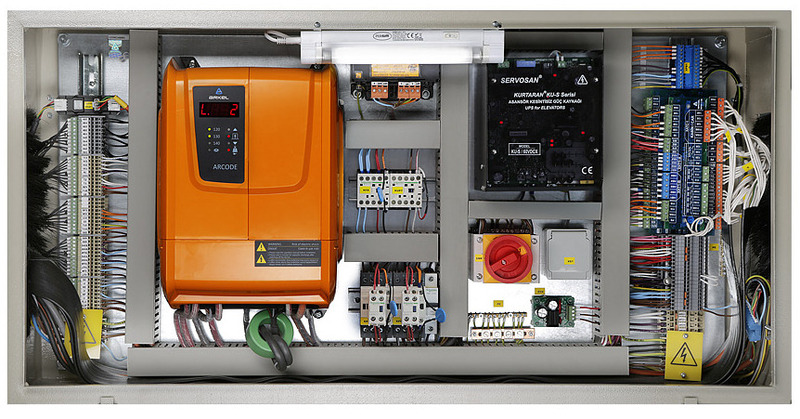 The control system provided by Oleva is based on the Arcode integrated control product. 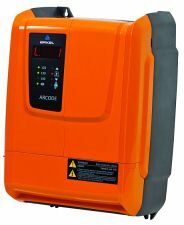 Arcode innovatively combines the controller, the inverter and emergency evacuation system in one versatile and powerful package. This allows us to design a wide range of possibilities for both geared and gear-less lift applications. The compact design aspect combines with the CANbus network to provide the perfect solution for MRL applications. We provide Auto-Rescue with battery UPS as standard with our control systems. In the event of a power failure, Arcode internally switches to UPS and drives the lift directly to floor and opens the doors. The PSE feedback is derived from the encoder on the hoist motor and accurately delivers the cabin direct to the floor. A ‘door zone’ detection unit ‘Liftsense’ provides additional feedback for re-levelling, confirmation of door zone and unintended movement of the cabin (A3 Compliance). The direct to floor ride profile and arched travel techniques result in excellent ride comfort and shortened journey times. Simplex, Duplex and up to 8 car groups. Floor serving from 2 to 64 floors. Full Wiring Solution provided as standard. ‘Plug and Play’ connections for LIP’s, LOP’s and COP. Optimised installation and set-up time. Fully wired Car Operating Panel with TFT indicator and ‘Plug and Play’ connection to CANbus. All fixtures comply with En81-70 (DDA requirements).